It was a chilly night but a lot of fun. We were looking forward to a double-feature drive-in movie night at Campus Crusade’s Headquarters. Our office, the Information Technology Group, helped with cooking, parking, and more. We had a good turnout with lots of families. Our staff had a large screen set up and people could even watch the movies from their cars and listen through their car radios. Mike helped grill hundreds of hot dogs. You can see a photo of Mike on our main ministry site. 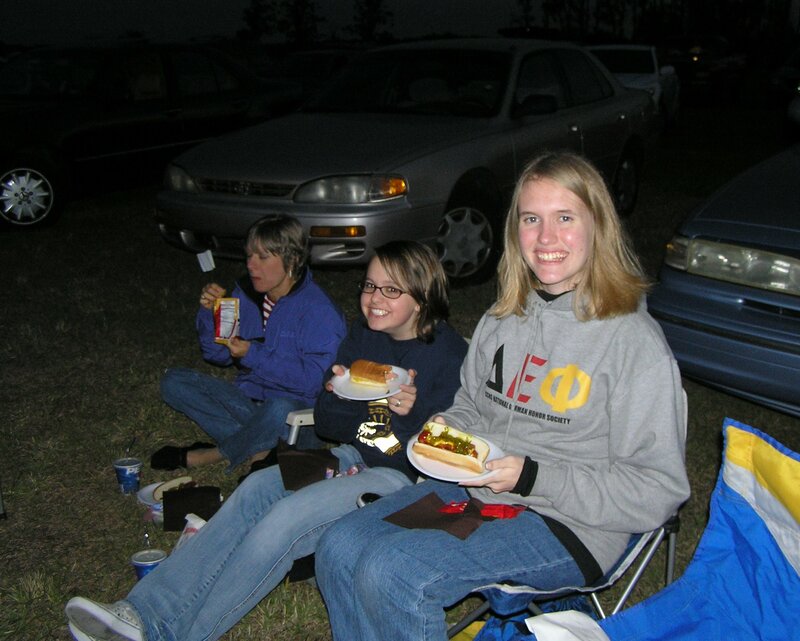 Jenny invited her friend, Nicole, and we settled in our folding chairs with our hot dogs and popcorn. I was glad I brought some extra blankets because the temperature was in the 50s! That kept the bugs away, I think. We bundled up and watched Ratatouille and National Treasure. I think this is going to be an annual event. We look forward to helping again next year!